to win a golden head dress...like Cleopatra's!!! have fun and I can't wait to see!!!!!! here's the CLEOPATRA video.......!!!! enjoy! I would LOVE if you would do Jasmine from the Disney movie Aladdin sometime. She is my favorite princess and I think you would look perfect for it! a. I love your blog and videos. b. what is all the fast forward music in your videos?!? A little off the topic of the above blog, but I figure if anyone (but myself) will care, you will! I was in Iraq for a year, eating the greasy mystery food and the calorie-loaded MREs and I gained almost 15lbs. I was so depressed when I got home because none of my clothes fit me anymore, at a time when all I wanted to do was look and feel like a pretty girl again. But then I started following your videos and the one about your diet and fitness is one of the first ones I saw. I got so motivated by how naturally gorgeous you are and how you just take care of yourself instead of crash dieting like the rest of the world seems to always be, I starting to see my body as something that I needed to take care of and treasure since it's the only one I have, and I've lost 7lbs so far! Not a huge mile stone, but I was so happy to see the number on the scale going down and my pants are starting to fit looser. Anyway, long story short. Thank you for being my motivation. I love your videos and your blogs and everything you're doing to help out all of these people you don't even know. You're very generous and so beautiful, inside and out. I love you so much, keep up the great work! Even though you've been doing all these costume videos lately (which I love by the way!) I was hoping maybe afterward you could make a video for those of us who live places with cold winter climates (like Colorado he he) about ways we can keep warm but still look good! This is something I find challenging...particularly with bottoms since a coat is usually on the top anyway ha ha. Ooo and maybe some winterie make-up looks! And hair too ha ha (like things you can do with your hair when you're going to be wearing a hat and take it off?). Thank you for everything you are! I love your makeup!! I am going to dress as Cleopatra for Halloween and I am wearing a baby blue dress. What color of eyeshadow should I wear? I love the colors you used and I am not too sure if I should team them up with the blue dress. I appreciate your response. Thanks! Thank you SO much for ALL the wonderful tips that you so happily give to us! YEA! 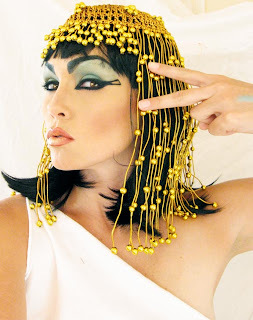 I found your site when I was looking for Cleopatra looks for my 12-year-old daughter who was dressing as Cleo for a Wax Museum at her school. Needless to say, after following your tips, she was STUNNING!!!! Thank you so much from both of us! I would love to share her photos with you!